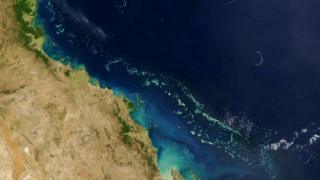 Image caption The Great Barrier Reef is the world's largest living structure and can be seen from space. Evidence that Australia's Great Barrier Reef is experiencing its worst coral bleaching on record has renewed calls for the UN to list it as "in-danger". The National Coral Bleaching Taskforce says 95% of reefs from Cairns to Papua New Guinea are now severely bleached. It says only four reefs out of 520 have no evidence of bleaching. Unesco voted not to put the reef on its World Heritage in Danger list last year, but green groups want the decision reassessed. Coral taskforce convener Prof Terry Hughes told the BBC his team was yet to find the southern border where the bleaching ended. "Tomorrow we will continue further south from Cairns to Townsville about 400km (250 miles) and spend the day scoring another 150 reefs," he said. Media captionWhat causes coral bleaching? Experts say it is too early to tell whether the corals will recover, but scientists "in the water" are already reporting up to 50% mortality of bleached corals. Climate change and the effects of El Nino are being blamed for the rise in sea temperatures that causes coral bleaching. "What we're seeing now is unequivocally to do with climate change," Prof Justin Martin University of Queensland told the ABC. "[At] the Paris climate change meeting, essentially the whole world has agreed this is climate change, and we're seeing climate change play out across our reefs". World Wildlife Fund (WWF) spokesperson Nick Heath said the unspoiled northern section of the reef had acted as a vital bank of genetic material to reseed areas further to the south. "We have been working to save the reef in [recent] years, and we always took for granted that we had the bank in the northern quarter that was safe, and seemed resilient in previous bleaching episodes, but now it's cooked to an inch of its life," Mr Heath told the BBC. The Department of the Environment said state and federal governments were investing a projected A$2bn ($1.5bn; £1bn) over the next decade to protect the reef.